Did you know that optimising your data centre for thermal efficiency typically reduces its energy bill by 15-20%? This significant saving is typical of what 4NG achieve when we install extra sensors and our monitoring and control software, SMARTset. By using SMARTset’s optimisation features, our customers can quickly identify hot spots and cold spots, and run ‘what if?’ scenarios using CFD Lite. CFD Lite is SMARTset’s super-fast operational Computational Fluid Dynamics (CFD) tool, designed to predict the effects of layout changes, equipment being added, and set point changes and failures. It works by presenting users with a map of their room, which they can use to adjust the layout, add equipment and set up ‘what if?’ scenarios. They then run a CFD Lite simulation on the room, and SMARTset calculates the effects of the changes they have made. The beauty of CFD Lite is that it takes approximately 5-20 minutes to complete, which is much faster than traditional CFD tools that usually take hours or even days. The speed of CFD Lite means it truly is an operational tool rather than a design tool – it allows you to run ‘what if?’ simulations several times a day, giving you more freedom to plan changes on an ad hoc basis. Does CFD Lite’s high speed mean a compromise in accuracy? To an extent, yes – CFD Lite simulations use a model that does not capture the same level of detail as a traditional CFD model. However, as the CFD Lite model is calibrated against real measurements from the data centre, its results are still very accurate – to within 3°C. This calibration step can be provided by 4NG’s professional service, during the commissioning of SMARTset, and usually takes 1-2 days. Once calibration is complete, any user can run the “what if” scenarios with very little training required. They can then use the scenarios to maximise the operation of the DC, reduce OPEX, maximise the capacity of your site and improve environmental compliance towards your preferred standard. You don’t need to understand the complexities of CFD to be able to run a simulation and understand its results. 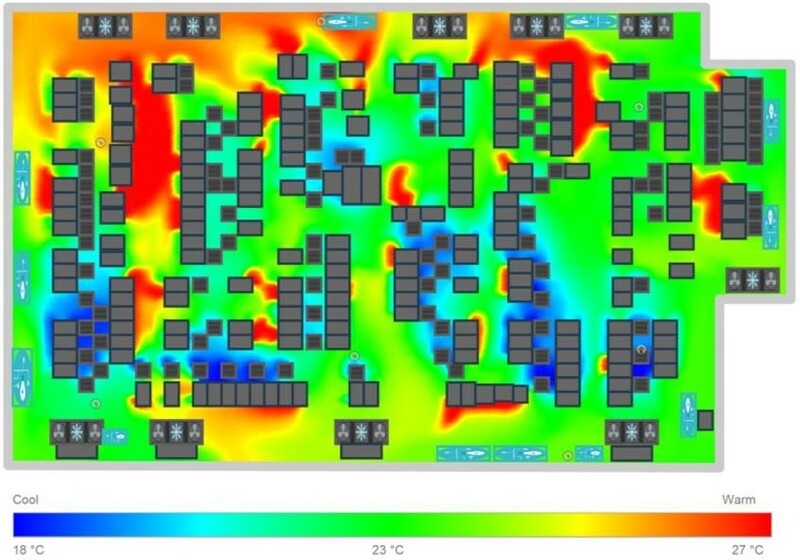 The simulation results are shown on a 2D thermal map layout of the room, so it is easy to see hot spots and cold spots. Also, SMARTset analyses each ‘what if?’ scenario for you and provides a report that highlights the key point of the scenario result. For example, it may highlight the maximum rack inlet temperature and its location. It is also easy to compare 2 scenarios, so that you can quickly identify the best option for your needs.